This little fellow wont scare away your friends and family, but welcome them with his country charm. Hang him on your front door or in your entry. Few materials required; wooden pieces, fabric scraps, raffia, wire, fiberfill stuffing, hat and paint. Project is simple to paint with some dry brushed detailing. Material cost is under $10.00. *Forsters ® Woodsies and FolkArt® Acrylic paints by Plaid ® Enterprises were used for this project. Supplies: scissors, glue gun and glue sticks, paintbrush, toothpick, paper plate, paper towel, pencil. Paint pieces as follows: banner Buckskin Brown, ovals Sunny Yellow, one small circle Buckskin Brown, large disk Linen and remaining pieces Licorice. Let dry. Dry brush banner edges with Linen. Face. Using picture as guide dry brush cheeks on linen disk with Burgundy, paint triangular nose in Glazed Carrot and let dry. With black marker draw mouth, eyes and stitch lines around nose. Wrap a few strands of raffia around four fingers, remove loops and tie center with another piece of raffia knotting to secure. Cut lopped ends and glue knot to center top of face. Glue hat to top of head. Hands and feet. Take one strand of raffia and wrap around two fingers, remove loops from fingers and tie one end with a small piece of raffia. Trim untied end. Repeat three more times. Set aside. Top. Cut two ¾ 1 square patches from brown plaid fabric. Cut remainder into a 4 x 8 rectangle. Fold fabric piece with right side in and glue long sides together to form a tube, let cool. Turn tube right side out and stuff with fiberfill stuffing. Glue one hand, knotted side in to each end of tube. Cut two 3 lengths from raffia and tie sleeves. Glue to bottom back of face. Cut a 7 length from black ribbon, tie into a bow and glue to center front neckline. Pants. With right sides together glue long sides of blue fabric, let cool. Turn tube right side out and stuff with fiberfill stuffing. Cut two 3 length of raffia. Glue one foot into each end of tube and tie with raffia. Bend pants into a 90o angle and secure with a dab of glue between legs. Hold in place while cooling. Glue one patch to each pant leg. Glue center top of pants to center bottom of top. Wrap remaining length of black ribbon around waist for belt, secure with glue. Crows. Dry brush edges of all Licorice pieces with Buckskin Brown. Glue rounded end of two teardrops to pointy end of one heart, then glue one Licorice circle on top of teardrops. With Glazed Carrot paint beak and dot eyes with Wicker White, let dry. Use black marker to draw nostrils. Repeat with second crow. 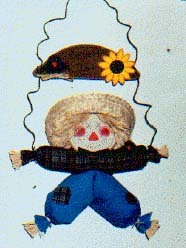 Glue one crow to right shoulder of scarecrow and second crow to left side of banner. Tie a length of raffia into a multi loop 1 ½ bow, glue below crow on banner for nest. Sunflower. Dry brush edges of Buckskin Brown circle with Burnt Umber and edges of Sunny Yellow circles with Glazed Carrot. Glue petals all around circle and glue flower to right side of banner. Hanger. Wrap one end of wire around left wrist of scarecrow. Loosely wrap the next 8 of wire around pencil to curl. Thread wire through left hole of banner. Now loosely wrap approx. 10 of wire around pencil to curl. Thread wire through hole on right side of banner. Curl remaining wire around pencil and wrap end around right wrist of scarecrow. Finishing. With black marker write Harvest Time on center of banner. Wrap one end of wire around left wrist of scarecrow. Loosely wrap wire the next 8 of wire around pencil to curl. Bring the beauty that is Fall into your home with this dramatic centerpiece. You can place this on your dining room table for holiday entertaining, or on a side table or mantle for a decorative accent. Separate wheat into two groups. Hold one group under wheat heads. Secure cluster with chenille stem to create a binding point. Repeat for other group. Cut apart oak and salal leaves, creating clusters. Position atop and beneath the wheat sheaf. Place stems of the leaves into the binding points to secure. Glue if necessary. Split eucalyptus in half. Place each group into a binding point, facing in the same direction as the wheat. Glue if necessary to secure. Add salal in the same fashion. Glue fruit to the wheat, leaves, and eucalyptus bundle. Apply glue directly to fruit and to stems of picks before inserting into centerpiece. Add ivy bunches to top. Glue in place. When clustering wheat heads, be sure to twist chenille gently so wheat is not cut by the binding. Supplies: embroidery needle, scissors, iron, beige thread, pins, sewing needle or sewing machine. 1. Attach fusible web to back of fabric pieces. 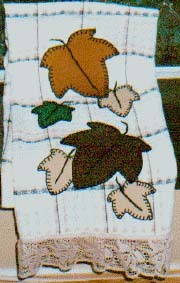 Trace patterns on paper backing, large leaf to dark and light brown, three small leaves to beige and one small leave to green fabric. Cut out leaves. 2. Remove backing from leaves. Using picture as placement guide arrange leaves on towel. Fuse into place with iron. 3. Embroidery. Use three strands of thread throughout. Stitch blanket stitch around leaf edges and stem stitch for stems. 4. Pin lace to bottom edge of towel folding edges over 1 and sew into place. I was standing outside enjoying the day last fall, when I noticed little acorns falling off the tree. I started collecting them in a shoe box thinking I could use them for something and it turned out to be a very lovely but creative idea. Of course, I suggest getting a wreath hanger because it is very heavy. First, spread the newspaper on a flat surface. Lay your wreath down flat. Heat your glue gun. Next, starting in the middle of the wreath begin gluing the bottom of the acorn. Place the glued part of the acorn in the middle of the wreath and stand the acorn straight up. Make 1 row in a straight line going all the way around the wreath. Repeat the process from top to bottom with the wreath still laying flat. Then decorate with flowers, bows, or even holiday ornaments. Be sure not to leave any open spaces except in the back. The back of the wreath shouldn't have any acorns on it so when you lay it down it is flat. A Step Further: Buy peanuts from a health food store. Slowly pour peanuts into a blender to make peanut butter as students watch. You may need to add a little peanut oil to improve consistency of the peanut butter. Let students sample the freshly-made peanut butter before sharing it with the birds. WARNING: CHECK WITH PARENTS BEFORE DOING THIS. SOME CHILDREN MAY BE ALLERGIC TO PEANUTS! Do you remember the last time you were in someone's home that had an apple pie baking in the oven? Ahhh, the aromas of a fresh baked pie -- it is simply irresistible! Place lemon juice in a large bowl, and stir in salt. Peel, core, and slice apples horizontally into 1/4" thick circles. Soak slices in lemon juice bowl for approximately 6-10 minutes, making sure each side of the slices has a chance to absorb some of the lemon juice. Meanwhile, mix spices in a bowl and blend well. Dust apples slices with spice mixture. Turn slices over and repeat on opposite side. Place apples slices in a single layer on a baking sheet. Bake at 150-200 degrees F for 6 hours or until completely dried. Apple slices should be slightly pliable. 1) Fold each apple slice in half, and then into quarters and thread the apples slices onto the wire. Continue to pack on the folded apples until the wire is completely filled. 2) When the wire is completely covered, use pliers to bend ends into hooks so that they can connect and close. Carefully shape wire into desired shape. I recommend either a circle or heart shape. 3) Using your ribbon or fabric scraps, create a hanger for your wreath. 4) Hang on your wall, or package as a gift for someone special. Cut of enough jute for your desired length of garland - remember, your apple garland shouldn't be too long, but approximately 2-4 works well. Also, it is always better to have too much, than not enough. 2) Start stringing on apple slices. Push one end of jute through the middle of each apple slice. 3) Consider alternating several apple slices and then a piece of tied on fabric strip. 1) Using an approximate 12" piece of jute, tie one end to about three cinnamon sticks that are laid in a a bundle. 2) Being to string on apple slices by pushing jute through the center of each slice. Consider alternating several slices with a piece of fabric tied on. 3) When apple stacker is the desired length, end with three more cinnamon sticks in a bundle and tie a loop so that you can hang your apple stacker proudly!